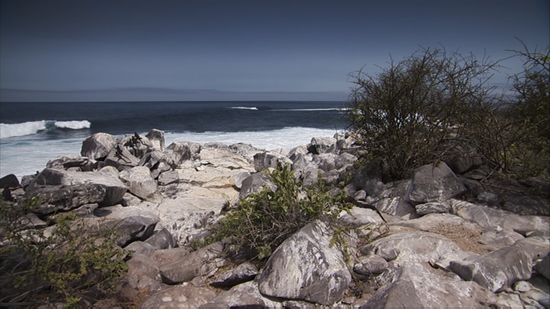 The 2013 documentary The Galapagos Affair: Satan Came to Eden sheds some light on a forgotten episode in history, a 1930s case where a random group of Europeans decided to escape civilization by putting down roots on a remote island in the Galapagos, stranded in the middle of the Pacific Ocean. As evidenced by the lurid blood stains on the DVD cover, this experiment in "getting away from it all" didn't end too happily. 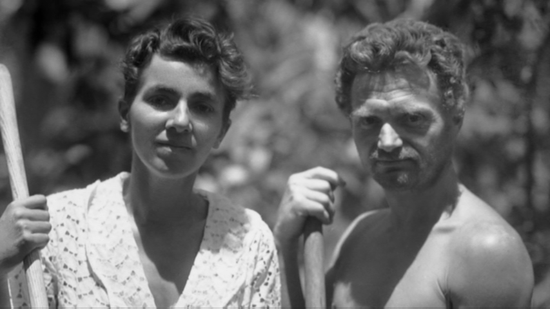 Using lively narration performed by actors and loads of old photographs and newsreel footage, directors Danya Goldfine and Daniel Geller made The Galapagos Affair into an interesting cautionary tale. 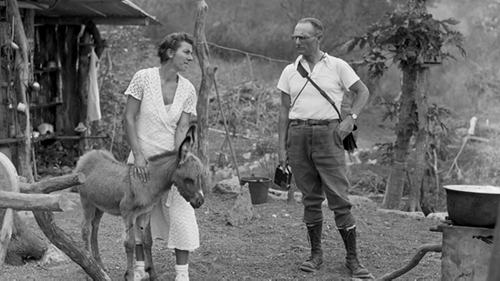 It started in 1929, when a Berlin-based philosopher and Nietschze admirer named Friedrich Ritter decided to take his mistress, Dore Strauch, to live on an island in the Galapagos. 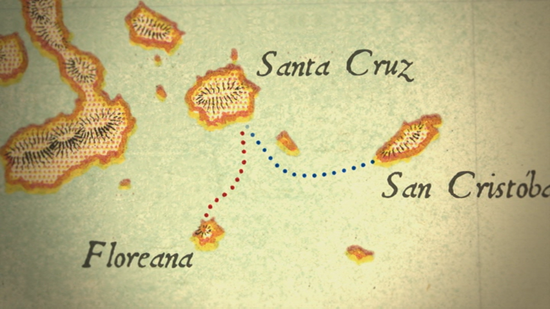 Although the couple could have chosen to settle on Santa Cruz, which already had small human settlements, they went further to the South to be the sole inhabitants on the desolate island of Floreana. With only iguanas, tortoises and birds to keep them company, Ritter and Strauch eventually set up a seaside shack, growing their own food from seeds brought over from Germany. Eventually, news stories on this "Modern Adam and Eve" made headlines all over the world. 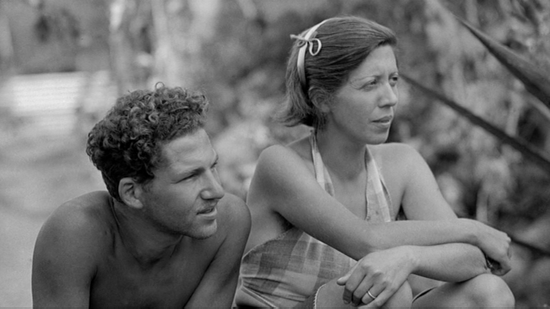 The Galapagos Affair challenges the idea that the ultimate in personal serenity is found in complete isolation. For Ritter and Strauch, the living-off-the-land ideal proved to be a struggle which took up all their waking hours. And, as if the unwanted press attention wasn't bad enough, the couple found themselves with new neighbors on the island. 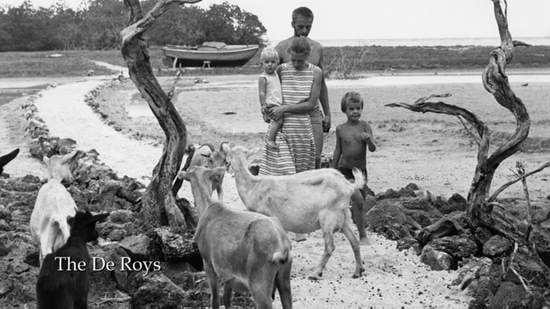 Lured by the stories of idyllic isolation and health-restoring benefits, fellow German Heinz Wittmer and his wife, Margret, arrived in 1932 hoping that island life will heal their son, Henry. Soon afterward, another visitor comes to the island with grandiose plans to open a luxury hotel. Claiming to be a Viennese Baroness, the vain Eloise von Wagner debarks with two male associates who are also her lovers, Robert Phillippson and Rudolf Lorenz. Despite being spread apart on this huge island, the Baroness' disruptive, odd behavior (which included hiring a film crew to make a silent melodrama based on her adventures) eventually wore on everyone else's nerves. The abrupt 1934 disappearance of the Baroness and Phillippson casts suspicion on Lorenz, who had been ostracized and treated like a servant by the other two in the love triangle. Since the other adults on the island also had motives to want the Baroness dead, however, this scandalous little episode has endured to this very day among the local islanders. At two hours, The Galapagos Affair could have easily been trimmed down to make this intriguing story less sprawling. It packs in a lot of leisurely-paced interview and archival footage which doesn't contribute much to the main narrative. Still, the filmmakers made great use of 16mm film of the original participants (including the campy, strange silent melodrama with the Baroness playing a primitive island queen), elegantly weaving it with narratives taken directly from the participants' letters and diaries. The exploits of Friedrich Ritter et. al. are supplemented with the recollections of modern-day Galapagos residents, other transplanted Europeans and Central Americans who managed to make harsh island living work over multiple generations. Normally, this might be seen as an intrusion, yet I found the current residents' stories of survival, growing up on a remote island, and yearning to escape as interesting as the old stuff - and it goes along with the film's main thesis that paradise is often what you make of it. The narrated parts of The Galapagos Affair are effectively performed by a cast of well-chosen actors. They include Cate Blanchett as Dore Strauch, Thomas Kretschmann as Friedrich Ritter, Sebastian Koch as Heinz Wittmer, Diane Kruger as Margaret Wittnmer, Connie Nielsen as the Baroness, and Josh Radnor as John Garth, a naturalist who frequently came to the island and served as the settlers' conduit to the outside world. Zeitgeist Films' DVD edition of The Galapagos Affair sports a clean 16:9 picture. The archival footage is appropriately in deteriorated shape, yet it's complemented with nice graphics and good, digitally photographed newer photography sporting lifelike colors and pleasant detail. Available in either 5.1 Surround or 2.0 Stereo, The Galapagos Affair's soundtrack has a good, professional sheen. Dialogue is pristine with little in the way of distortion, while the music track is seamlessly integrated for a smooth listen. Optional English SDH subtitles are also provided. 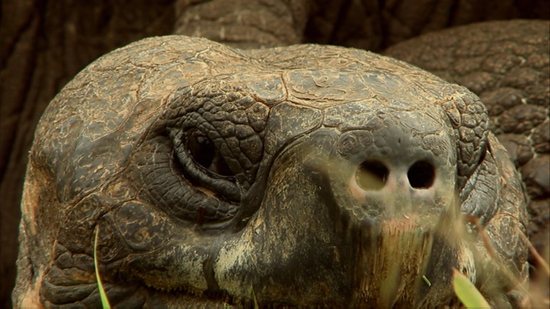 About 40 minutes' worth of Deleted Scenes are included, mostly incidental anecdotes from the current Galapagos residents. It wraps up with some beautiful, lengthy nature footage. There's also an 8-minute Galapagos at Telluride talk with directors Danya Goldfine and Daniel Geller speaking with film historian Annette Insdorf. A Theatrical Trailer and a Directors Statement printed on the inside of the DVD insert round out the bonus content. While The Galapagos Affair: Satan Came to Eden is one of those documentaries that stretches out a few ideas to their absolute limit (two hours' worth), it's still an enjoyable, mostly satisfying look into a forgotten episode in exploration. Like a back issue of National Geographic taken over by egotists, the story it tells is part of the long, complex history of arrogance run amok. As one of the participants succinctly puts it, "Paradise is not a place." Recommended.